Additionally, client projects won't be moved over, regardless of their contents. Wait a second...why not? Because Basecamp 3’s approach to clients is so different from Basecamp 2’s, we aren’t able to bring these projects over. For example: in Basecamp 2, you'd add your client to a project, and they'd log in. In Basecamp 3, clients never have to log in, everything is sent to them via email. Another example: Basecamp 2 let you "hide this from the client". In Basecamp 3, everything is hidden from the client, you just send them what you want to. For a client project in-progress, we suggest finishing it up in Basecamp 2. For the new client projects coming up, start it in Basecamp 3. Click Invite more people and then click The Client tab. Remove any clients shown there. Click Turn this option off. The project will now show for importing inside your Basecamp 3 account. To help make this transition easier, we've also created a special plan that'll let you keep running your existing Basecamp 2 projects (including client ones) running for free. More on that later. Many companies (like ours) have switched from Basecamp 2 to 3 by simply leaving all our projects in Basecamp 2, and treating it as a long-term archive. Because Basecamp 2 will continue to run till the end of the internet, and because we'll let you keep your Basecamp 2 account for free, you could follow this approach too. Just treat Basecamp 3 as a fresh start, and begin everything new over there. Others want to take the opposite approach, and bring their entire history over to Basecamp 3. That way it'll all be in one place. You might find it helpful to do a bit of both. Pick up the things you're currently working on and bring them over to Basecamp 3 — everything else can stay in Basecamp 2. Whatever approach you decide to take, keep in mind that nothing will be deleted or removed from either Basecamp 2 or Basecamp 3 without you explicitly doing so. That means changing your mind is okay. So give it a shot, see what sticks, and change what doesn't. Read through the explanatory text (it will walk you through all the details of what gets moved over) until you see the Got it, I'm ready to get started button. Click that button! You can migrate projects from any Basecamp 2 account you own. If you're on multiple Basecamp 2 accounts, you'll be asked which one you'd like to move projects from. Any users on the projects you migrate will come along with those projects. After that you'll see a list of projects. You can move over active and archived projects. Any archived Basecamp 2 projects you move will stay archived in Basecamp 3. Projects that are in the trash can't be moved over. Be patient, especially if you're moving a project with lots of files. Those can take some time to move! You'll get an email once your project is in Basecamp 3. Once everything has been moved over, your Basecamp 2 project will be archived, and you'll see your project in Basecamp 3! Will people be notified about the project moving? Nope. We don't do anything to tell people that you've moved a project from Basecamp 2 to 3. But once the move has finished, they'll have access to the new Basecamp 3 account, and they'll see it in their list of accounts on Launchpad. Will everyone in my Basecamp 2 account be added to Basecamp 3? Yep! Everyone in your Basecamp 2 account will automatically be invited to your Basecamp 3 account when you import your first project. What if I change my mind, and want to go back to Basecamp 2 for my project? No problem! You can simply unarchive your Basecamp 2 project, and pick up where you left off. That said, anything you added to the project in Basecamp 3 won't be reflected in Basecamp 2. Will I have to keep paying for Basecamp 2? It depends. If you want to keep creating new projects in Basecamp 2, you'll need to keep paying for it, otherwise you can keep it for free. The next page in this guide will give you a full rundown. 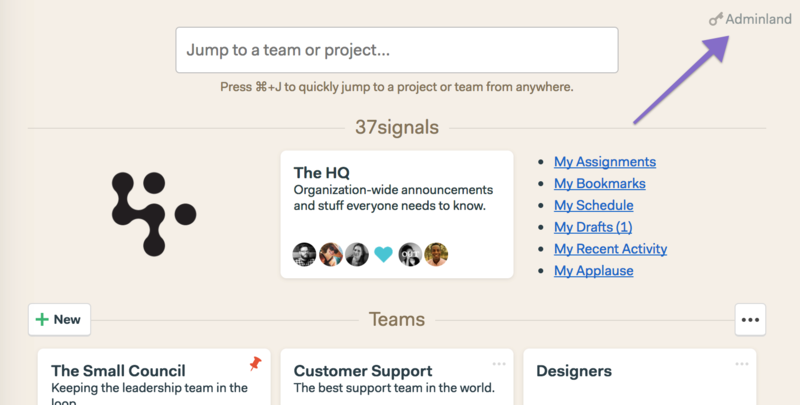 Can I move projects over from Basecamp Classic to Basecamp 3? Kinda. There's no direct way to move your projects from Basecamp Classic straight over to Basecamp 3. If you'd like to though, you can move your Classic projects over to Basecamp 2, and then from Basecamp 2 over to 3.